When we’re not busy building compost bins, raising chicken coop frames, and removing vicious 6 foot weeds, we here at LETS GO Chicago like to kick back… by waking up at 6:45 am and taking an hour long train ride to Chinatown. 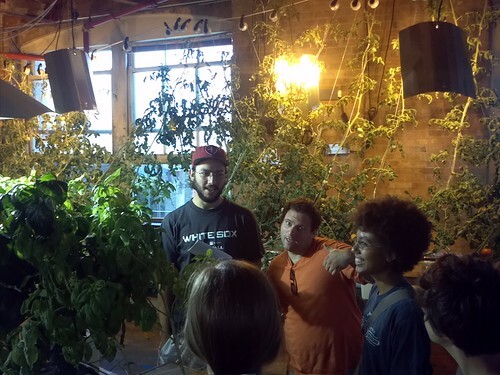 While we didn’t get any Chinese take-out, we got something that was even better than hand-made ramen: a FREE tour of one of Chicago’s urban farming centers, UrbanPonics, LLC. UrbanPonics is the brainchild of Bral Spight and Lee Reid, two men from extraordinarily different backgrounds thrown together during a leadership conference. 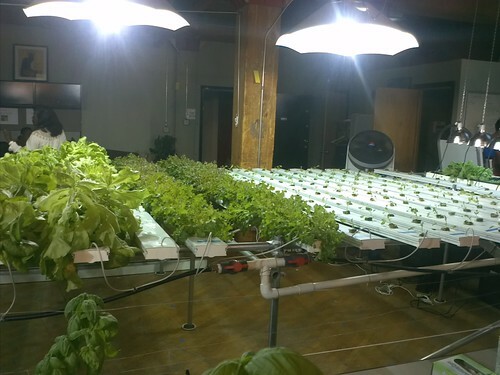 The result of a bit of collaboration was a hydroponics concept lab in the Riverfront Work Lofts, a thriving part of Chicago’s Creative Industry district right next to Chinatown. Now, Urbanponics employs several economically disadvantaged men and women and has successfully produced a high yield of lettuce, tomatoes, and herbs. 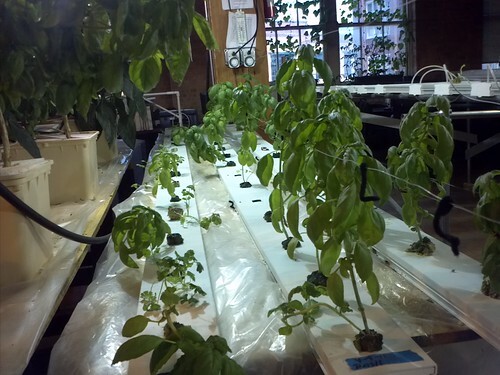 UrbanPonics uses a technique called hydroponics to grow plants without soil. Instead, minerals are dissolved into purified water and streamed through the plant’s roots, providing everything a plant needs to grow without any soil borne diseases or pests; lights of varying wattage provide year-round ‘sunlight’ for the plants, while inorganic “growing mediums” like rock wool offer structure for the stems. These four components- minerals, water, light, and structure- are all the plants need to grow, and thrive, indoors. The LET'S GO team exploring the facilities. 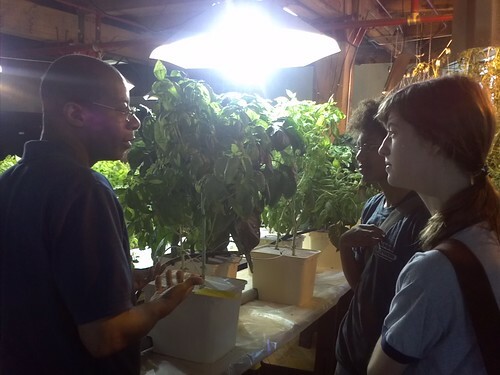 But UrbanPonics is more than just a lab for indoor farming; it’s a lab for science skills and business knowledge, and for engineering techniques and artistic finesse. In short, it is as much a center for innovation as it is a center of contradictions; the work conducted at UrbanPonics is nothing short of a miracle, but it is so intuitive that we had to wonder: why isn’t every city doing this? For as much or as little as you care about agribusiness or monocrops, hydroponics is still pretty cool. Imagine getting fresh lettuce NOT from the other side of the country, or the world, but from a farm in your city. A farm you can visit easily- via public transportation perhaps?- that also has a wide variety of greens, tomatoes, cucumbers, and other crops. Fortunately, our days of dreaming of a full scale urban farm may be at an end. Mr. Spight and Mr. Reid plan to expand their concept lab into a 4 acre facility in Chicago’s South Side, complete with 50 bee hives, rain water collection, and a co-generative energy system. UrbanPonics made for an exciting, inspiring, super-fun, and informative field trip!! To visit yourself, go to 500 W. Cermak Road, Chicago, Il, a few blocks from the Red Line.